Aquapub, A Floating Bar | OhGizmo! I feel a sort of personal pride in this product: it’s made in Canada. See, we don’t only manufacture industrial quantities of snow and maple syrup! 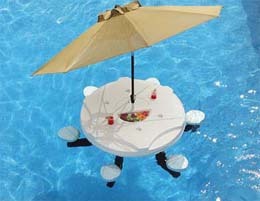 It’s a six person floating bar made by canadian company Custom Design Inc.. It weighs only 85 pounds, so you and a buddy can assemble it and toss it right in the pool without popping a vein. There are six glass holders, for your drinks, and two removable containers (for food and such) recessed into the surface. The structure is allegedly unsinkable and can handle six people weighing up to 250 healthy pounds each. If you’re the lonely type, you can sit alone as well, and the table will only tilt 7 degrees. If that’s too many degrees for you, insert two floating noodles under your seat to reduce the tilt to two. Sadly, price was too allusive to determine. The website is right here. Story VIA Designspotter.